While some choose to head to the ski lift for a bluebird day, hikers know there's nothing like assenting a mountain with the backdrop of a bright blue sky and snowcapped peaks in the distance. Crisp and mild winter weather makes for beautiful hiking conditions. However, as temperatures can drop quickly on these days and wet, slushy or icy terrain can create hazards, having the right hiking gear is essential this time of year. Winter hiking requires lots of layering and insulation. As Section Hiker explained, layering is key for the different points of your hike. At times, you'll be exerting excessive amounts of energy and find yourself removing layers, while some sections will be flat and moderate, requiring you to add layers. Your base should consist of long underwear, a long sleeve jersey for insulation, warm socks and sock liners if you wish to wear them. Next, hard-shell pants that block both water and wind will go over your long johns. These should have full-length zippers in the event you need to vent heat from your legs. On top, a mid-layer fleece, vest or soft-shell jacket will go next, Section Hiker advised. You may even want to wear multiple mid-layer items. All winter hiking jackets should have hoods and be either insulated and puffy or waterproof and windproof. Additional clothing can include a fleece or wool hat and gloves, hiking boots with insulation and gaiters. In fact, more than one hat is recommended. A facemask can help block wind and blowing snow, as well. Always avoid wearing cotton and similar materials when hiking, as they take extremely long to dry once wet. Did you know that you can lose body heat from sleeping on cold or snowy surfaces? As such, if you plan to camp overnight on your winter hike, REI recommended using two full sleeping pads under your sleeping bag. For the sleeping bag itself, ensure that it is winter-weather-approved and rated at an average of 10 degrees less than the coldest temperature you plan to hike and camp in. These winter sleeping bags will have draft tubes and draft collars, which help trap heat. An important tip is to keep your sleeping bag dry, especially if it's made of goose down. As soon as it gets wet, down looses much of its insulation. Investing in a sleeping bag liner is also wise, as it can add several degrees of warmth to your sleeping bag. A ground cloth for your tent will act as a barrier between the wet, snowy ground and your tent liner. 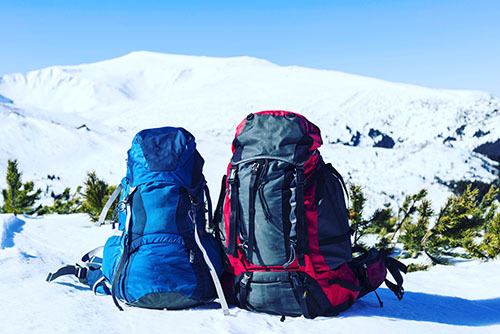 For those thrill-seeking adventurers hiking through avalanche terrain or at high elevations above the tree line, additional equipment is a must. As the Appalachian Mountain Club explained, however, the following suggested gear requires practiced expertise and is not for the first-time hiker. Seasoned veterans with experience hiking in extreme winter weather should consider bringing an ice ax and crampons. Using crampons in addition to your boots provides even more traction in slippery conditions. While great for snow hiking, this piece of gear is essential for ice climbing. When trekking through areas at risk of avalanche, having an avalanche probe and avalanche beacon is also a must. These tools could prove life-saving in the event of a disaster on the mountain. Snow shovels and extreme first aid kits are also advised. Believe it or not, you will need sunscreen and sunglasses on your winter hike. Even though the weather won't seem to agree, the sun can be even brighter in the winter when reflecting off the white snow. Maps, whistles and head lamps are other items that will be of use on your expedition, whether on a single day hike or overnight. Tools or a small knife are also handy to have with you. Be sure to pack flashlights and extra batteries, as well as supplies to start a fire. Keep in mind that low temperatures are known to deplete battery life. Most importantly, make sure that your cell phone is fully charged and that you have your solar powered PRW3510Y-8 with you. In some conditions, poles can be beneficial for navigating the snowy terrain. When hiking in the winter, be sure to use a wide-mouth water bottle, as systems with a hose to your mouth have the potential to freeze in cold temperatures, Section Hiking noted. Keep in mind that winter hiking checklists are dependent on the terrain, weather and hikers themselves, the AMC club noted. As such, each trip should be thoughtfully planned and researched so you and your fellow hikers know what kind of forecast you can expect, and then dress and pack accordingly.